Gift pack with mountain gorilla facts, an adoption certificate, a greetings card, and tips on how to live a greener and more environmentally friendly life. Wild-World magazine delivered three times a year – a great read for all ages. Mountain gorillas live in very close-knit communities with up to 30 members in each group. They can climb trees, but prefer to stay on the ground, as they are big and heavy and break all the branches! In each group they have one dominant male leader, though other males may challenge him during his reign. Overall though gorillas are relaxed and laid back creatures. They would only get involved in a conflict situation if they felt their family was being threatened. If they did feel that, you’d better stay out of their way! 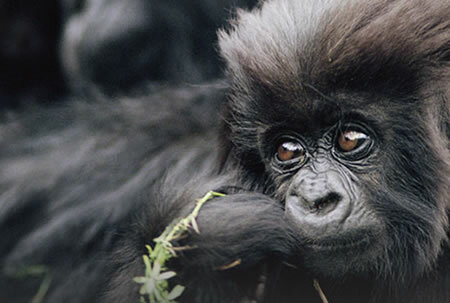 Sadly, there are less than 870 mountain gorillas left on the entire planet. Your kind donation will help WWF to train and equip anti-poaching patrols whilst working with local governments to ensure conservation laws are enforced to protect their habitat. It’s also great as a last-minute gift as the gift certificate can be printed or emailed immediately following payment. Due to their nomadic nature, gorillas build new nests every day our of tree branches and grass. Mountain gorillas very rarely drink water, as the plants they eat provide more than enough moisture to keep them hydrated. If you ever encounter a gorilla in the wild (which is unlikely!) be sure to stay still and don’t stare at it. Gorillas very rarely attack humans, but if you follow our advice, you should be fine! Gorilla’s are highly intelligent creatures, and some that have been kept in captivity have even been taught human sign language. Hi there, I’m a mountain gorilla, and I’m one of the biggest mammals in the jungle. I love to hang out with my friends and family, but due to poaching and the destruction of my habitat I am now an endangered species. In fact, sadly there’s less than 900 of us left on the planet where once there were many. Please adopt me and help provide funds to train rangers to protect us from poachers, as if any more of us are killed we will disappear from the planet all together. Please help us. Gorillas are social animals so they live in groups usually comprising of between 25 to 35 members. There is usually a dominant male accompanied by a number of females who carry their young. A new born baby on average weighs about 2.5 kilograms which is about half the weight of a new born human baby. Don’t be fooled because a new born gorilla baby develops twice as fast and can walk by the time it reaches 40 weeks and by the time it is three years of age it slowly becomes independent. By the time they are six years old a gorilla measures about 1.20 meters and can weigh 70 kilograms. At about this age is when a female gorilla becomes mature though it will continue to gain weight for the next four years. Males in contrast only reach maturity when they are ten years old when the black back starts turning grey at which point it is time to leave the parental group. Typically a male who leaves will wander alone or join other males prior to attracting other females who may join them so they can start their own family. Gorillas take a long time to reproduce which is why it is difficult to increase the world population rapidly. The gorilla will gestate offspring for 8.5 months and a female gorilla will give birth once every four years. The unfortunate fact however is that 30 per cent of babies do not survive their first year because of accidents or disease. Another reason behind baby deaths is that when the father dies another silver back assumes a leadership role and will often kill the babies of the previous dominant male so that his own genes are secured for posterity. The hierarchy within a gorilla group is clear and very important. The dominant male enjoys the top rank and the adult females rule over the younger ones. Male gorillas achieve a higher ranking in response to their size, a male mountain gorilla for example can reach 1.70 meters and weigh 200 kilograms. Besides sheer strength, the dominant male must prove he has the abilities and experience to protect the family from intruders and danger. The mountain gorilla starts its day at sunrise and after waking up begins looking for food which takes up much of the morning. As a general rule, gorillas spend 30 per cent of their waking time feeding, another 30 per cent is spent travelling and the balance 40 per cent is spent resting. Gorilla families live mainly on the ground in contrast to many other primates. A gorilla family will not travel much further than a kilometer per day and they have a range of approximately 20 square kilometers. Gorillas are herbivores and whilst on occasion they may eat insects and ants, their main meal consists of some fruits, shrub, vines, and pith of herbs, leaves and roots. A male gorilla can eat up to 20 kilograms of food per day and because gorillas are able to obtain most of their water from its diet they almost never have to drink. Gorillas tend to spend their afternoons playing and resting. Playing is a very important aspect of their social life, particularly for the younger gorillas because it is responsible for integrating them into the group. At the end of each day, just before it starts getting dark the gorilla will start building its nest where they will spend the night. 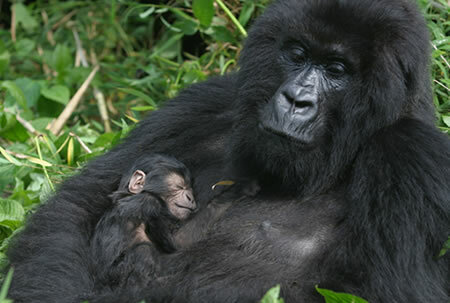 Each gorilla will have its own nest with the exception of babies who sleep next to their mothers. Nests are either built in the trees or on the ground and are carefully constructed by branches of bushes and other plant materials. The gorilla is the largest of all primates. A mature male gorilla can weigh up to 500 pounds, and measure over 6 feet tall. The gorilla has an arm span of 8 feet and has the strength of between 4 to 8 strong men. The female gorilla is about half the size of a mature male. Like human beings, the gorilla also has two arms, two legs, 10 fingers and toes, small ears and 32 teeth. Unlike humans they have much longer arms and are more muscular. Their big toes look like thumbs and their bodies are covered by dark hair. An adult male turns into a “silverback” by the time he reaches the age of 15 when he is fully mature and the hair on his back turns silvery grey. Gorillas usually walk by placing their feet flat and walking on the knuckles of their hands. Gorillas have the ability to stand up right but rarely do so. When they do it is usually to slap their chests. The gorilla does no beat its chest with its fist, instead it is with an open cupped hand that makes a familiar sound which can indicate excitement or aggression. Gorillas can live up to 50 years, the new born gorilla is tiny, weighing about 4.5 pounds and is helpless at birth, depending on their mothers for a minimum of 3 years. Gorillas communicate with one another through gestures, facial expressions, body postures, vocal sounds, drumming, chest slaps, and odors. Although they have no ability to make the same sounds as humans, they have the ability to understand spoken language and communicate in sign language. There are just 880 mountain gorillas left in the wild. The last remaining mountain gorillas face the threat of extinction in the mists of Central Africa’s Virunga Volcanoes. The gorilla is the largest and rarest of the great apes and is also one of the closest relatives to the human being. The gorilla is also one of the most endangered mammals on the planet and is being threatened by disease, war, poaching and loss of habitat. 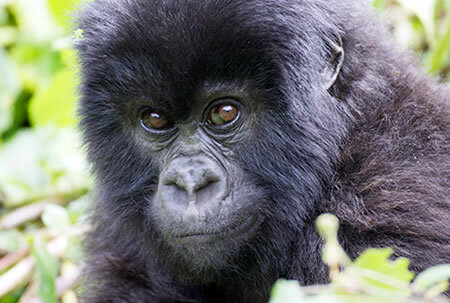 The mountain Gorilla is considered “Critically Endanged” according to the IUCN Red List. This means the gorilla is at high risk of becoming extinct in the wild in the immediate future. The gorilla is at risk of disease. Sharing a very similar DNA sequence to humans means that the gorilla is vulnerable to many of the diseases that affect us without the same kind of immunological coping mechanisms that deal with harmful pathogens and viruses. They are usually exposed to such dangers through human tourists, livestock and other animals as humans increasingly encroach on their habitat. The wild mountain gorilla can only be found in the mountain ranges that span the Democratic Republic of Congo, Uganda and Rwanda. As human settlements expand and agriculture increasingly conflicts upon precious remote gorilla habitat this has led to a fragmentation of forested areas which has meant that gorilla groups have become isolated and that has cut back on genetic diversity. There are already signs of inbreeding with some younger gorillas having webbed hands and feet. The mountain gorillas of Virunga National Park are threatened by human presence. They face threats from violence that results from large numbers of people who use the park land for agriculture. Gorillas are also the target of poachers who sell them off as trophies or to zoos and even hunt them for food. Baby gorillas are at particular risk of the illegal pet trade which can end up with the parents being killed. Even when they are not the target, Gorillas are maimed or killed by traps set for other animals. The remaining gorillas that are left live in a part of Africa that has plenty of refugee problems stemming from war and unrest. This has meant their habitat has been destroyed as new settlements and farms have been created and water has been extracted from their feeding grounds. In some cases gorillas have been hunted to feed people who are displaced and are sometimes the victims of mines placed along forest paths. In the mists of the Virunga Volcanoes of central Africa the last remaining mountain gorillas face extinction.The rarest and largest of the great apes, they are among our closest relatives yet one of the most endangered mammals on earth. They are threatened by poaching, loss of habitat, disease and war. Mountain gorillas are an important resource for the people of Rwanda, Congo and Uganda across whose borders their tiny forest habitat stretches. Political instability and war have caused many set-backs, but as peace slowly returns, the economic potential of mountain gorilla conservation has also re-emerged.